So with the changing of the seasons, I recently conducted my semi-annual “flipping of the closet” ritual. It entails putting away my summer sundresses and replacing them with all my dark, woolly, and otherwise fall/wintry clothes that have been sleeping in a bin for the past six months. I love this time of year, and I really love pulling out all my favorite fall clothes that I’ve missed for so long. Seeing as yellow, orange and brown are my favorite colors, autumn is definitely my season. That being said, Boise enjoys four quite lovely and distinct seasons, and it always feels as though they change just exactly when the calendar says to. I’ve recently begun referring to this season more frequently as “autumn” rather than fall. It’s such a lovely word, autumn, and now I have the most adorable baby niece named Autumn. She was born September 9 (two years ago actually, so I suppose she’s not a baby anymore…) and fittingly her parents named her after the loveliest of seasons. I sent her a birthday card this year with this quote from Albert Camus: Autumn is a second Spring when every leaf is a flower. 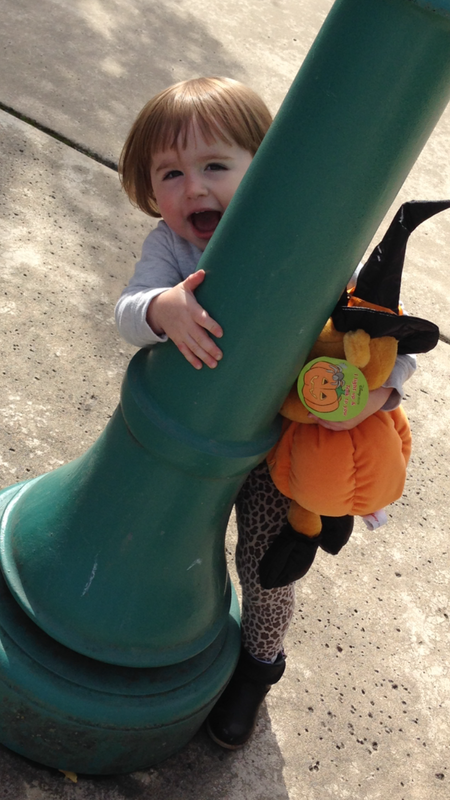 She is so adorable, and every bit as beautiful as the brightest of autumn leaves. Autumn is when we celebrate the harvest, and are reminded of the abundance with which God blesses us every day. We look to the markets and the fields and take note of the fruits of the farmers’ labors. We extend gratitude for all of the “things” we have–our homes, our loved ones; food in our bellies and joy in our lives. 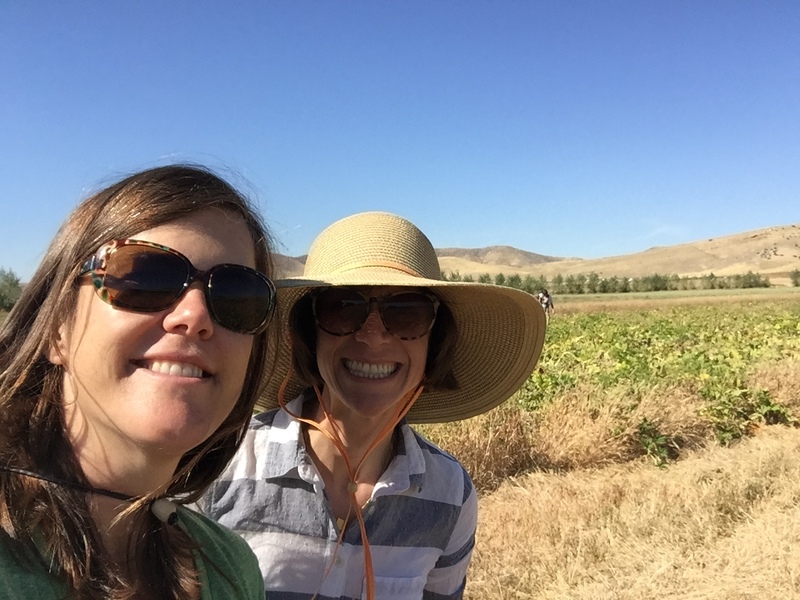 A few weekends ago my friend Carrie joined me for the harvest festival at Peaceful Belly Farm. This was the farm where I subscribed to my “share” and received a basketful of fresh produce every week since May. They always end the season with this festival and let people glean from the fields–picking the leftover eggplants, peppers, tomatoes, etc, that remain on the vine as the season comes to an end. Biblical, indeed, to witness the abundance in those fields–the bushels of vegetables being carted away so that they wouldn’t be left to rot. One of my favorite lines in the Episcopal eucharist liturgy is when the priest speaks of the ordinariness of the elements: Wheat of the field, and work of human hands. Fruit of the vine, and work of human hands. Human hands have definitely been hard at work nurturing the fields and vines out at the farm. 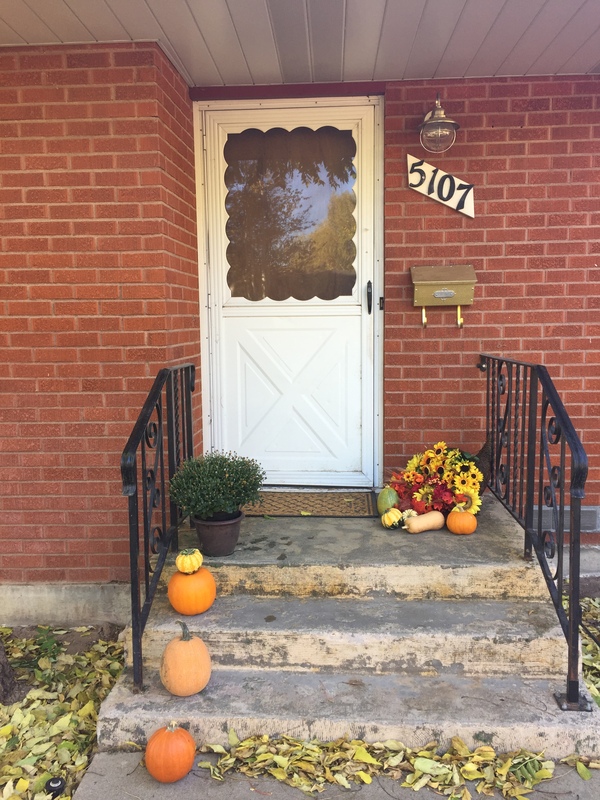 Last weekend I also made the easiest of crafts and created a cornucopia for my front door step. I bought the horn for $2 from the thrift store, and months ago my friend spotted me a few bucks at a yard sale so I could buy armloads of silk flowers (which are shockingly expensive when bought new, I might add…). Winter squash from the farm spill out from among the foliage. Abundance, indeed. The horn of plenty. A home of plenty. Part of my closet organization project involved mastering my electric drill. Boy, was that ever empowering! 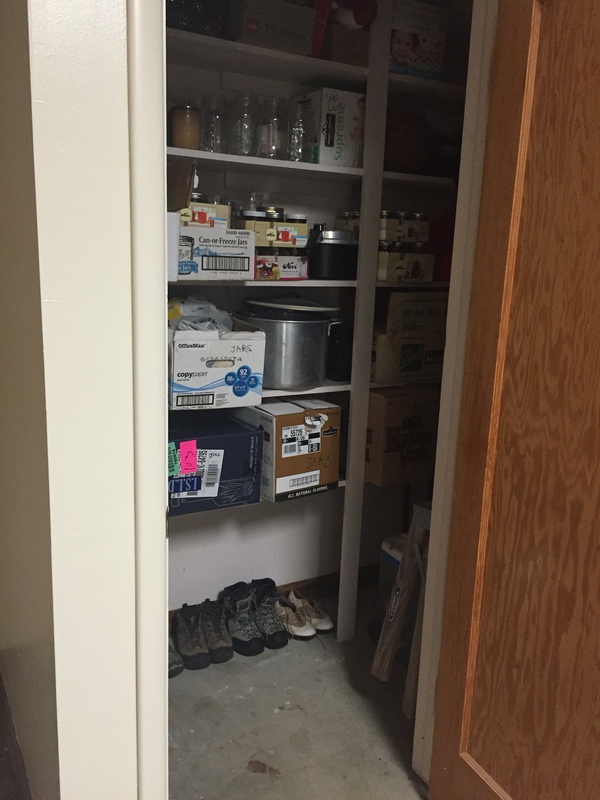 You would have laughed to see me systematically moving through each closet, from the garage to my bedroom, screwing whatever I could into the wall to maximize the usage of the spaces in my various small closets. I hung lawn chairs and a step ladder on the inside of the garage pantry. I installed one of those “broom-hanging” bars in my kitchen pantry so that all my “handled” cleaning tools are nicely hung up on the wall. I even put two hooks inside my sewing room closet so I can suspend my ironing board from them. And my hall closet got a full makeover. I spent about $5 at the thrift store and purchased a set of baskets to contain my gloves, hats, etc, and hung a few more hooks on the walls. It doesn’t look that different, but I know that now there is a lot more storage space, which will be nice when winter comes and I start wearing gloves and hats again. Now that I have a full house, I’ve enjoyed filling it with furniture and other items that carry a story and some meaning behind them–pieces like family heirloom furniture, artwork from my travels, and other items that have been gifted to me since I bought my house. Rather than just buy new, stock furniture from a big box store, my home has been filled with unique pieces that carry special memories based on who gave them to me or in what funny circumstance I happened upon them at a yard sale or thrift store. My house is pretty quirky–it’s definitely a reflection of its owner, I admit… I’ve had a few moments of wondering if there is “too much going on” with my interior decor, and if I’ll tone it down eventually and just get some staid furniture from Costco or RC Willey. But I hope I don’t ever do that. I prefer things that are one-of-a-kind, rather than things that are one of exactly thousands of others just like them. Truly, I really haven’t “needed” much since I moved in. My mom contributed so many household goods from her own backstock, and my former house was pretty well stocked with whatever I needed to cook and make a home. And so I have to say, it has felt rewarding to me to adjust my habits and go to the thrift store down the street first, whenever I do need something. I almost always find something there that can meet my needs and prevent me from buying new. 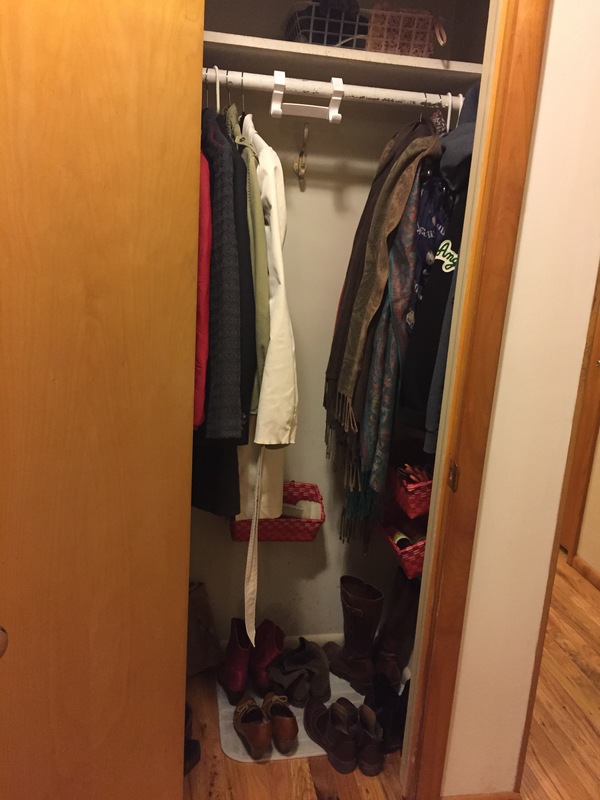 I find the idea of closets quite interesting–the fact that it has become standard in homes in America to keep a container for extra items in literally every single room of the house. Not just the bedrooms–but the bathrooms, the hall, the entry way, the garage, the kitchen, the laundry, etc… Spaces to hold the extras that we feel we will need at some point, but which are also things that we don’t want others to easily see. So I’m fascinated by the idea of secrets too–knowing that we all carry things within ourselves that nobody else knows and which we do not wish to reveal, either. We keep them tucked away, deep down, not readily seen by visitors in our lives. Closets are useful not just for storage, but also as a quick escape in which to dump a bunch of stuff that we want to hide when we receive an unexpected guest. We all do it–it’s the instant housekeeping solution: pile away the junk and close the closet door, and suddenly the house looks so much tidier. And I think we do that in ourselves as well, hiding away our secrets and our excesses and our struggles, especially when someone new comes into our lives. We would feel embarrassed if they stopped by and saw all that junk spilled out everywhere. It feels improper for a stranger to see what we’re really holding inside. Maybe if they get to know me and become my friend, then eventually I’ll let them see the inside of my closet, and I won’t feel embarrassed. But until then, I’m going to put up a front that I have everything together and nothing is out of place in my life. I don’t think it’s a surprise that the gay community began using the phrase “in the closet” to refer to one who has hidden away one’s sexual identity–one who hasn’t yet made it known publicly that he or she is homosexual. It’s something private and intimate and special. Like other things we keep in our closets, it’s something important that we need and want to keep, but which we also hide away and don’t necessarily want just anyone to see. I’m not gay, but I certainly have my secrets. Experiences and thoughts and wonderings and knowings that are hidden away in my head and in my heart and which I don’t want others to see. Things I’ve said and done, things I’ve witnessed and heard, that I’ve hidden away in the darkness of my internal closet. There is liberation in opening those closet doors–letting in the light, picking out things that I don’t need to keep anymore and which can be thrown or given away. Memories and hopes and longings that don’t fit me anymore. Things that I’ve worn out or are stained and of no good to me any longer. There is freedom in de-cluttering and organizing, in making room for the sake of making room, but also for the sake of creating space for something else to fit there eventually. In writing this blog, I’ve made a big step in opening up my head and my heart for others to see. To de-clutter my mind by sharing thoughts and musings and wonderings, instead of keeping them in the closet. I admit, it’s vulnerable, and vulnerability connotes fear and anxiety and a sort of powerlessness. But for me, vulnerability also conveys a sense of intimacy and trust. If I’m going to open up my head and my heart and my closet to you, I’m trusting that you won’t judge me for all the crap that’s piled up inside, and that perhaps you may assist me in cleaning it out–throwing some things away that I don’t need to keep inside anymore. My sister and I have developed an informal tradition of going through each other’s closets the night before a visit with each other comes to an end. We’re fortunate as sisters to be able to wear each other’s clothes. I think as we get older our styles are diverging a bit. My sister is a black/gray girl; I’m more of a warm tone girl. She likes modern, I like vintage. But still, we do like a lot of the same things, and it’s fun to trade and borrow clothes from year to year. I’m always surprised at the memories and stories we associate with our wardrobe. Undoubtedly we each tell each other when or where we bought a certain item that we highly prize and that the other wants to borrow–shoes from Italy, dresses from great vintage shops, scarves from our travels around the world. I bought that when I was in such-and-such a place, so be careful with it and don’t get rid of it… We reveal a lot about how we view ourselves through the clothes we wear–what we present openly to others is a reflection of what we feel inwardly about ourselves. And we embody those memories and travels and stories when we wear them on our sleeves, literally. Our closets are store houses of those memories; containers of who we used to be, who we want people to believe we are, and who we want to become. Ok, thank you for reading and for letting me clean out my closet on these pages. I know I am creating openness in my life, and that I am also making space for other things to find their place in my head and my heart. 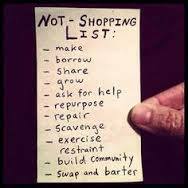 Now go clean out your closets and get rid of something you don’t need!